Global temperatures in 2018 were 0.83 degrees Celsius warmer than the 1951 to 1980 mean, according to scientists at NASA’s Goddard Institute for Space Studies (GISS) in New York. Globally, 2018’s temperatures rank behind those of 2016, 2017 and 2015. The past five years are, collectively, the warmest years in the modern record. Since the 1880s, the average global surface temperature has risen about 1 degree Celsius. This warming has been driven in large part by increased emissions into the atmosphere of carbon dioxide and other greenhouse gases caused by human activities, according to Schmidt. These raw measurements are analysed using an algorithm that considers the varied spacing of temperature stations around the globe and urban heat island effects that could skew the conclusions. These calculations produce the global average temperature deviations from the baseline period of 1951 to 1980. NOAA scientists used much of the same raw temperature data, but with a different baseline period and different interpolation into the Earth’s polar and other data poor regions. 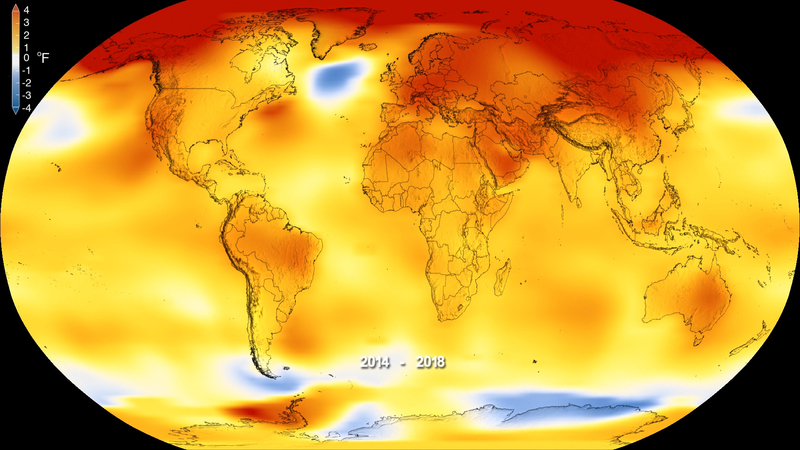 NOAA’s analysis found 2018 global temperatures were 0.79 degrees Celsius above the 20th century average. GISS is a laboratory within the Earth Sciences Division of NASA’s Goddard Space Flight Centre in Greenbelt, Maryland. The laboratory is affiliated with Columbia University’s Earth Institute and School of Engineering and Applied Science in New York.